Graeme has made an outstanding contribution to Refereeing croquet nationally and internationally and to the construction of the present Laws of Association Croquet. Graeme John Roberts began playing croquet at the Montecillo Club in Dunedin in 1970. His first experience of the Kelburn Club, where he has been a member for 34 years, was in November 1973, when he competed in the Junior Invitation Event at the club and recalls that it blew a gale for all five days of the competition, varying only in direction. After working (and playing croquet) in England for six years, Graeme joined Kelburn in 1981. The following January he won the New Zealand Men’s Championship Singles and was selected as a member of the New Zealand MacRobertson Shield team for the competition to be played in Australia the following November. In 1984 he won the New Zealand Men’s Championship Singles for a second time and also the New Zealand Open Championship Doubles, partnering Richard Clarke of Gisborne. Graeme represented New Zealand at the Sonoma-Cutrer world singles competition in California in 1990, and at the World Croquet Federation (WCF) World Association Championships twice, in 1990 and 2005, both times in the UK. He played in two New Zealand representative teams in 1990 in matches against the Great Britain and Ireland team visiting New Zealand for the MacRobertson Shield. He has won the Wellington Association Open Singles four times and his club’s Championship Singles 12 times. Graeme was appointed one of the founding members of the NZCC Laws Committee in 1986 when it was re-established by Ashley Heenan and Jean Corry after a lapse of many years. He took over as Chair of the Committee when Jean retired in 1990 and has served on the Committee continuously since then. 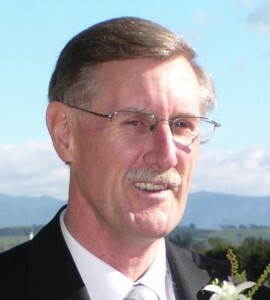 He served as the Wellington Association Referee from 1984 to 1990. He has been Referee of the Tournament for the MacRobertson Shield contest twice, for the WCF World Association Championships three times (once in France) and for Trans-Tasman test series three times. He has also refereed at international level at the MacRobertson Shield twice (once in Australia) and the inaugural WCF Women’s World Association Championships in Melbourne in 2012. He was elected a Life Member of the NZCC in 2000. As part of his duties on the NZCC, Graeme was involved in the mid-1990s with the attempt to understand the Egyptian rules of Golf Croquet (recently translated from Arabic) and to apply them to the new version of the game then rapidly gaining ground internationally. Some of the rules proved problematic: for example “It is forbidden to wear a complete suit.” The following sentence – “The shoes should be without heels.” – survived, however. Graeme married fellow Croquet player and long-time croquet partner Pamela George in 2006. He lives in Waikanae. 1986 Member & recording secretary, 1st Meeting of reinstituted Laws Committee initiated by Ashley Heenan OBE and Mrs Jean Corry. Since 1992, Graeme has been the compiler of Umpires, Referees and Senior Referees examinations for New Zealand. 2014 Life Member Kelburn Municipal Croquet Club Inc.